This is my take on salsa verde, basically a green vinaigrette using fresh herbs. I wanted to make salad to go with my lasagne that would cut through the rich and cheesy flavours and to be a bit different I’ve used a raspberry vinegar that would give the salad a fruity edge. This salsa verde would also make a great sauce for putting on mozzarella and toast, or even something a bit different to dip into with your french fries. This recipe couldn’t be simpler, just add all the salsa verde ingredients (apart from the olive oil) to a blender and whizz up until you’ve made a smooth paste. Then add the olive oil gradually until you’re left with a thin vinaigrette consistency. Have a taste and use your own judgement and preference if you need to add more of a particular ingredient. Season with salt and pepper. Place the lettuce/s leaves in to a large bowl. Slice the avocado, tomatoes, red onion and scatter on top. Tear up the mozzarella and add to the salad. 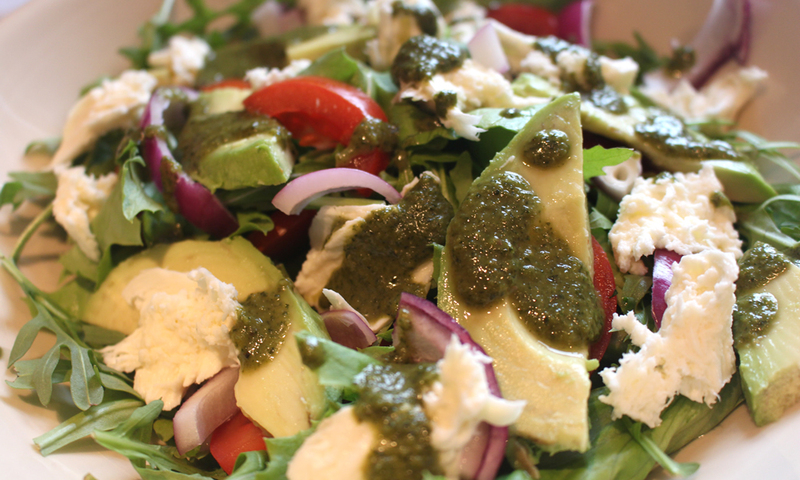 Finally drizzle the salsa verde over the salad and serve.